Winter months in the Benelux countries are not known for blue skies and bright sun. 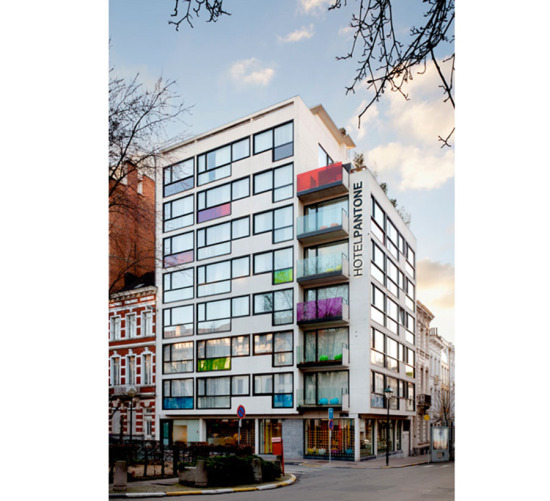 So perhaps there's an altruistic underpinning to the design of the new 59-room Pantone Hotel in Brussels. Did architect Olivier Hannaert and interior designer Michel Pennemann seek to lift the seasonally-depressed spirits of the populace through the colorful palette? We'd like to think so, although the relentless branding campaign by the client raises a smidgen of doubt. To wit: The Pantone roller bag won't get lost in the sea of black Tumi bags on the luggage carousel. Trundle down the hall, and find your color-coded room: Key fobs graphically remind you where you are—if that's necessary: Once inside, the bed linens resemble a color chip; the walls, even more so: Room service! Maybe a spot of tea will help you feel at home: Expecting visitors? Invite them to pull up a chair: Unpacked, it's time to go explore the city. What better means of transportation—conveniently available through the front desk—could there possibly be, to best appreciate the local architecture than a two-wheeled color swatch? And in case you've forgotten a toiletry essential, never fear—Pantone is here (and increasingly everywhere). Mexico City's posh Polanco neighborhood is now home to the recently redesigned Living Rooms of the W Mexico City. 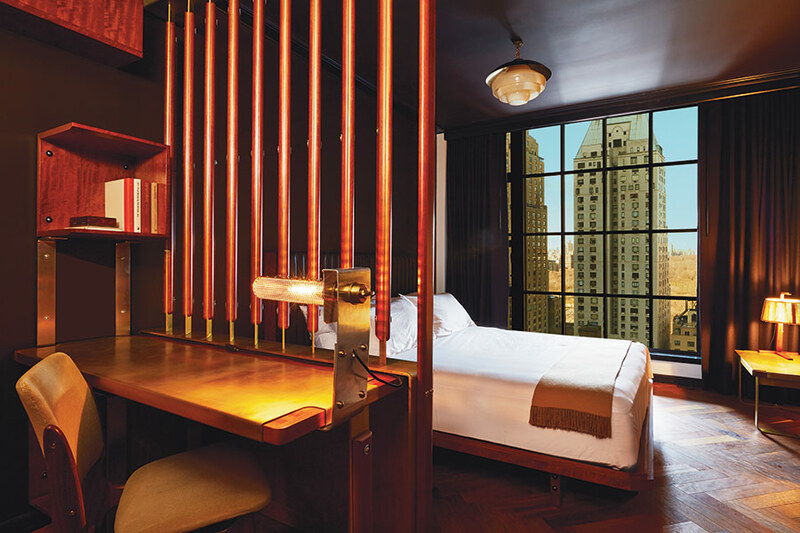 Part of a larger $100 million campaign to update its hotels across North America, the W asked New York City–based nemaworkshop, a firm that has been known to—quite literally—turn design on its head, to bring a sense of mystery and illusion to the hotel's common spaces. Guests are greeted by a translucent and inverted glass pyramid as soon as they enter the lobby, which holds secret messages that can only be seen at night. Surrounding the pyramid, a ring of seats take the form of eerie masks when seen from the rear. 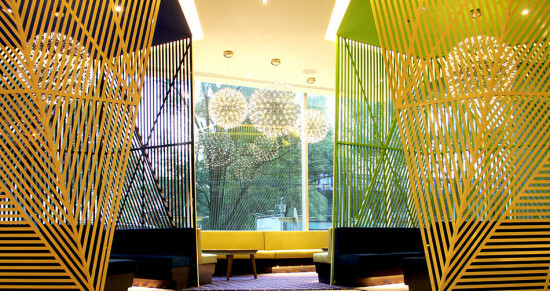 In a VIP lounge nearby, colorful laser-cut screens provide privacy while maintaining a connection with the larger space and surrounding neighborhood through an expansive glass facade. At the central bar, guests can look up to a ceiling of shifting waves generated by the reflective surfaces covering the ceiling, meant to give the illusion that one is in the midst a sea of moving water. 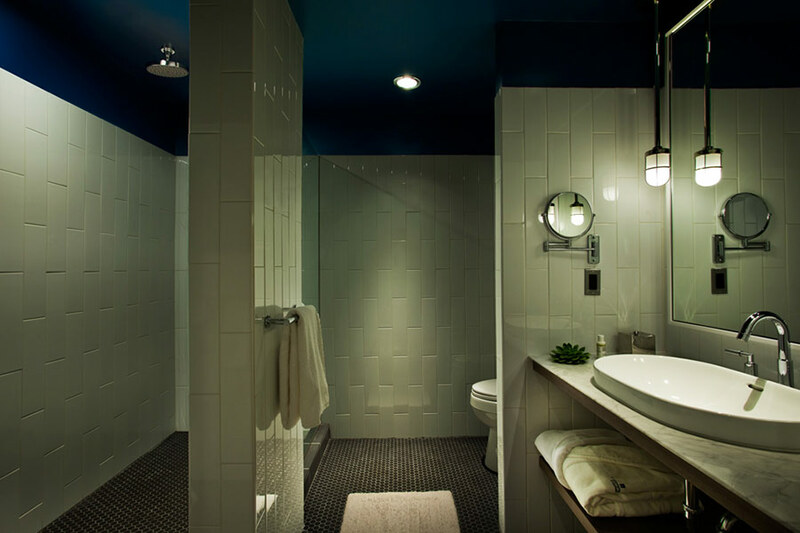 Elsewhere, an unexpected tequila bar is set inside a dimly-lit bathroom. Reflective surfaces are paired with natural stones, rippling metals, and sleek geometric walls and carpets to create a series of visual effects throughout the new space. The lobby, which had not been updated since 2001, is now filled with colorful artwork and puzzling arrangements that pay homage to Mexico City’s rich history and create a series of illusions for visitors. Nemaworkshop is also working on updating the hotel's guestrooms, which will be revealed later. 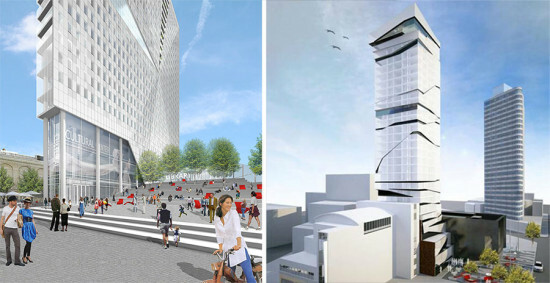 Construction has started on two towers set to rise in the BAM Cultural District in Fort Greene, Brooklyn. 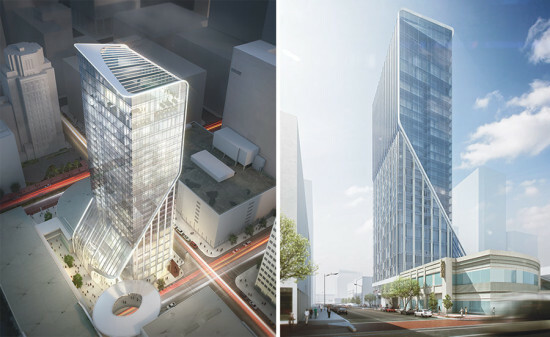 Unlike most new projects in the area, one of the buildings to rise off Flatbush Avenue, a 32-story structure designed by Brooklyn-based architect Thomas Leeser, will not be luxury apartments, but a 200-room boutique hotel run by Marriot. 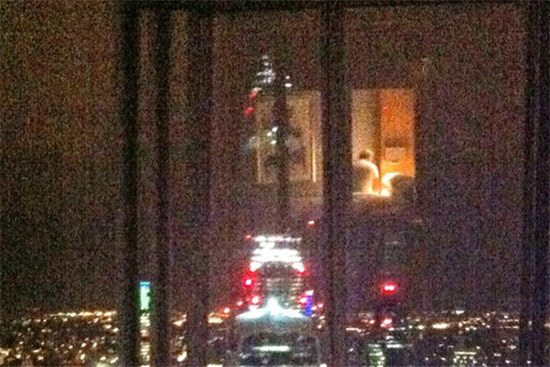 The tower is one of the most architecturally distinct high-rises to arrive in Brooklyn in quite some time, with prominent, asymmetrical carve-outs along its glass facade that make it appear as if someone—or something—has slashed through its skin with a knife. The hotel includes a performance space in the basement, a bar on the roof, and a restaurant at ground level that overlooks a new public plaza. 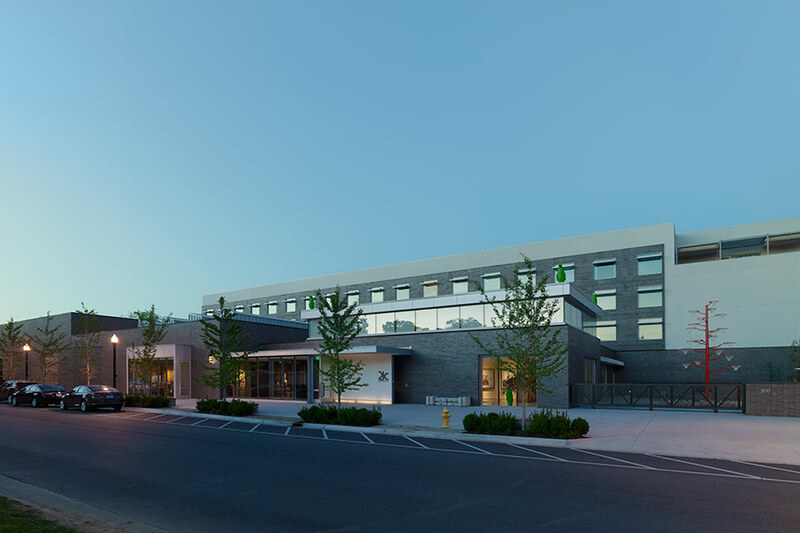 The hotel is sited between the H3 Hardy-designed Theatre for a New Audience, which opened last year, and a mixed-use, 27,000-square-foot project designed by Dattner and SCAPE. Nearby on the corner of Flatbush and Lafayette avenues, Enrique Norten of TEN Arquitectos is building another 32-story tower on a wedge-shaped lot. 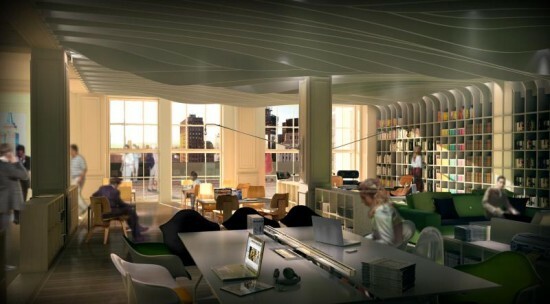 According to AN's earlier reporting, that tower "includes approximately 50,000-square-feet of creative and cultural space that will be shared by BAM, 651 ARTS, and the Brooklyn Public Library. 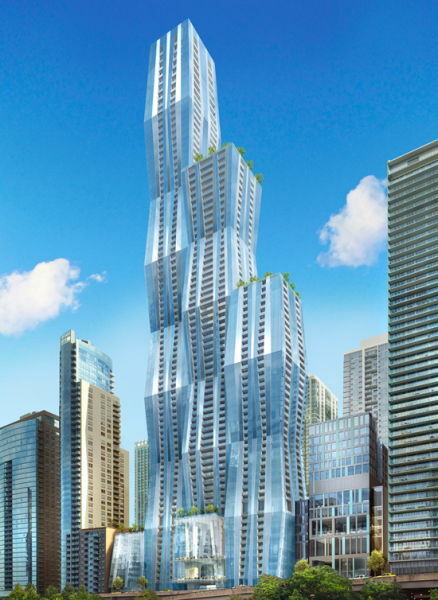 In addition, the tower will include approximately 23,000-square-feet of ground-level retail, as well as approximately 300 to 400 apartments, 20 percent of which will be affordable." Adjacent to the tower is a 16,000-square-foot plaza. It is only fitting that a crowdfunded hotel slated for New York City has a crowdsourced design as well. 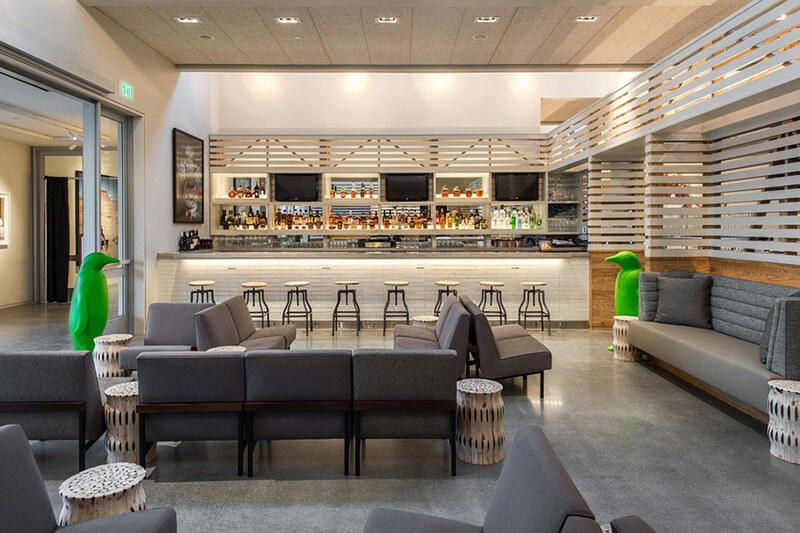 For its new, extended-stay hotel at 17 John Street, developer Prodigy Network, along with design blog PSFK, launched the Prodigy Design Lab, which allowed designers from around the world to submit plans for the project's interior spaces and digital services. After 70 submissions were received and 10,000 votes cast, three winners have been announced. "The winners of the 17John competition were intuitive to the needs of travelers, creative in the interactive spaces and understood the function of extended stay residences,” Rodrigo Nino, the founder and CEO of Prodigy Network, said in a statement. “This will be one of many design competitions presented to the crowd and we look forward to empowering those with the greatest ideas.” These three plans, which were selected by a jury from the ten finalists, represent three categories: private space, communal space, and digital experience. The winning private space design, "Weco, The Nomad Company" by Vianney Lacotte creates a live-work environment with space for entertaining and storage. For public space, "Hub" creates a wood-paneled reception area, fitness center, rooftop terrace, and communal workspace that looks like just about any startup company. And the "Deeply Integrated Services for the New Type of Hotel" proposal is an app meant to to better connect a guest with the hotel. Playing up the project's cooperative nature, the developer described this project as the "World’s First Cotel,” which is designed to “to meet the changing needs of the modern business traveler and through its innovative design will foster wellness, connectivity and efficiency.” The $31 million Cotel will transform an existing 1920’s apartment building with a multi-story glass addition designed by Winka Dubbeldam. According to Prodigy's website, "accredited investors can purchase REPs (Real Estate Participation) in 17John and buy into the project’s operating returns and equity appreciation. The REPs are being sold at $50,000 each." 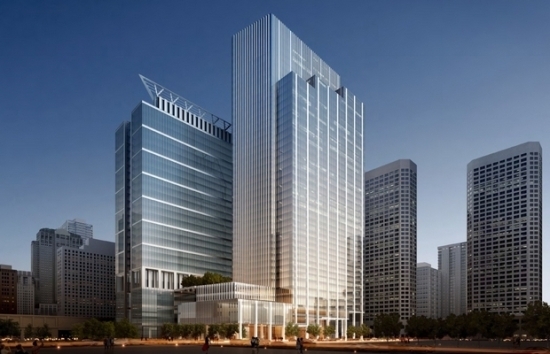 The project is expected to open in 2017. Take a look at the winning designs below. 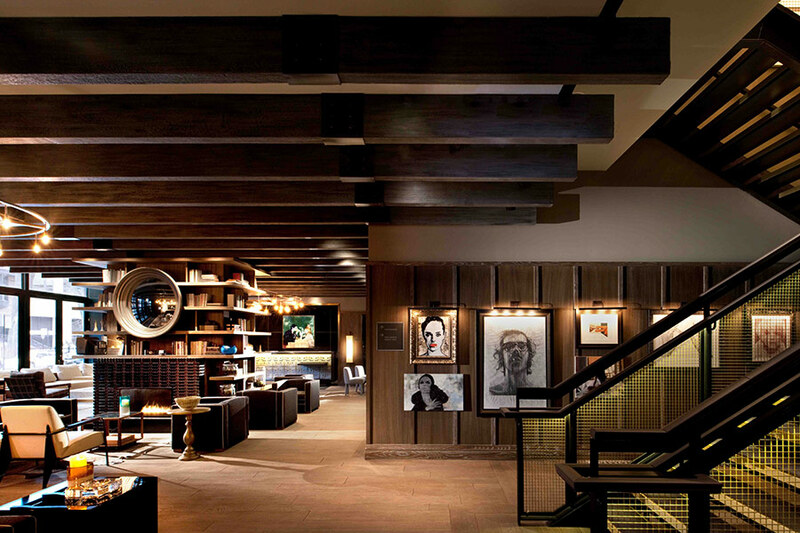 The Arkansas outpost marks the third 21c hotel, all designed by Berke. 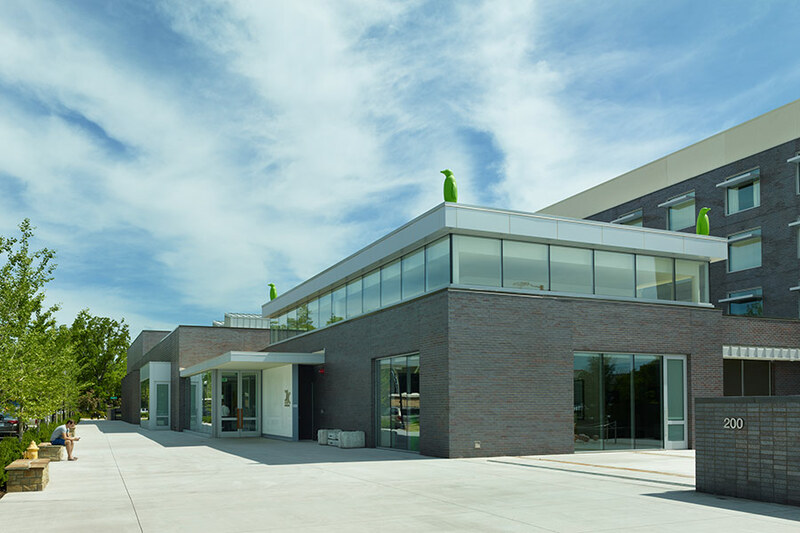 The hospitality company emerged in 2006, when two art collectors in Kentucky—Laura Lee Brown and Steve Wilson—commissioned Berke to convert old warehouses in Louisville into a hotel and museum filled with 21st-century art (hence the name 21c). The project was a hit and led to a similar venture in Cincinnati. The Bentonville location was the first to entail ground-up construction. For the flat, open site, Berke created a simple composition of two distinct, rectilinear volumes. A one-story volume fronts the street and houses public functions (a lobby, restaurant, and exhibition space); behind it, a four-story volume—the town’s tallest building—contains the guest rooms. White walls and polished concrete floors characterize a series of stripped-down galleries, which are open to the public 24 hours a day. The atmosphere is warmer inside The Hive, a casual restaurant where guests sip coffee by day and cocktails by night. “We really wanted an active bar and restaurant area,” said Berke. A 125-seat dining room contains wooden tables and chairs and soft banquettes. 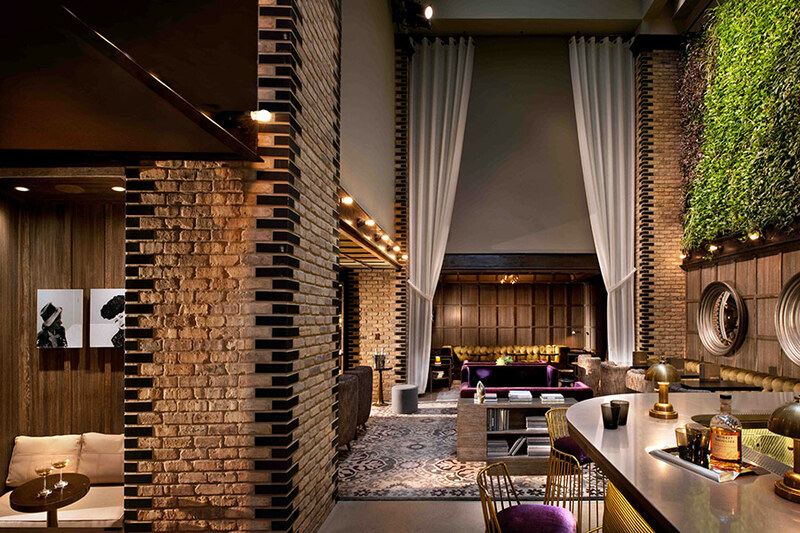 In the lounge, the bar is faced in white brick and topped with indigenous limestone. The guest rooms are “simple and gracious,” said Berke. 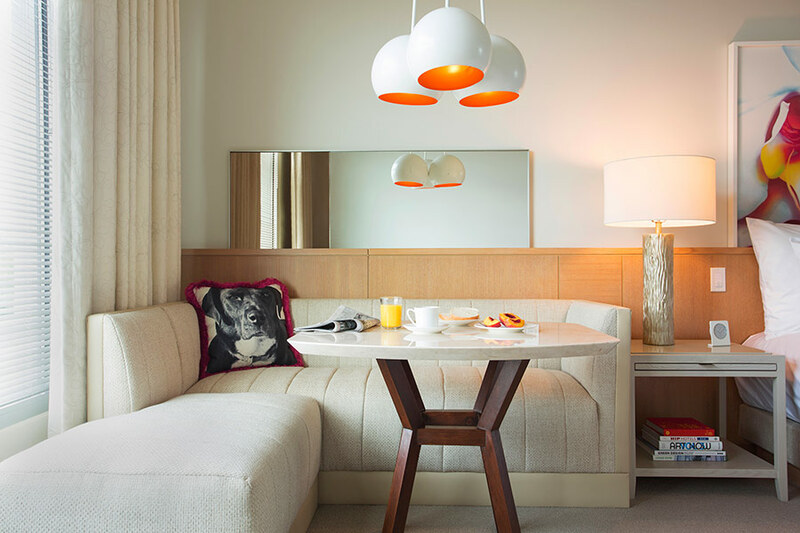 Featuring a neutral color palette with dashes of color, the rooms are outfitted with tasteful modern furnishings and original artwork. Co-owner Brown even contributed her own creations, such as photographs of farm animals screen-printed on throw pillows. Berke emphasized that the hotel’s art program is not some contrived branding experiment. “It’s true to the soul of who these people are,” she said of the owners. “They’re smart, inventive, and delightful to work with, and they believe in what they’re doing.” That passion seems to be paying off. 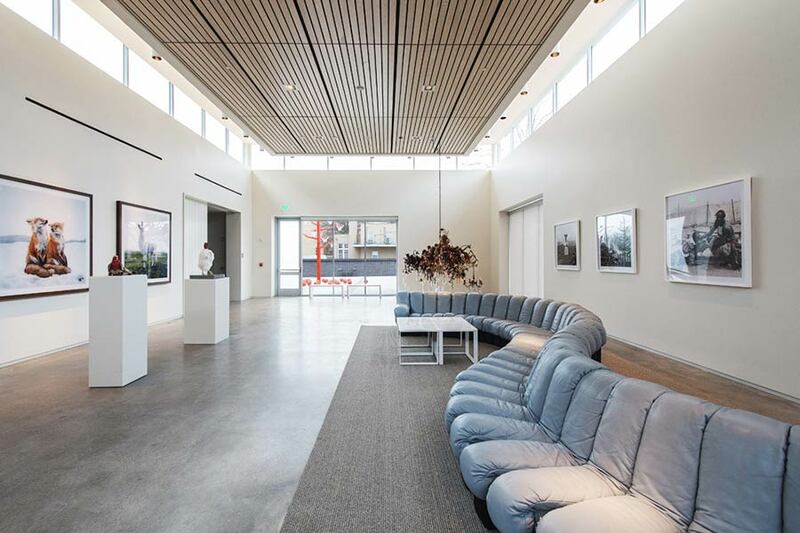 Berke is currently designing 21c Museum Hotels for Lexington, Kentucky, Oklahoma City, and Durham, North Carolina—promising to put more American cities on the cultural map. Since its founding in 1984, the Rockwell Group has developed a robust portfolio of contemporary spaces imbued with drama. 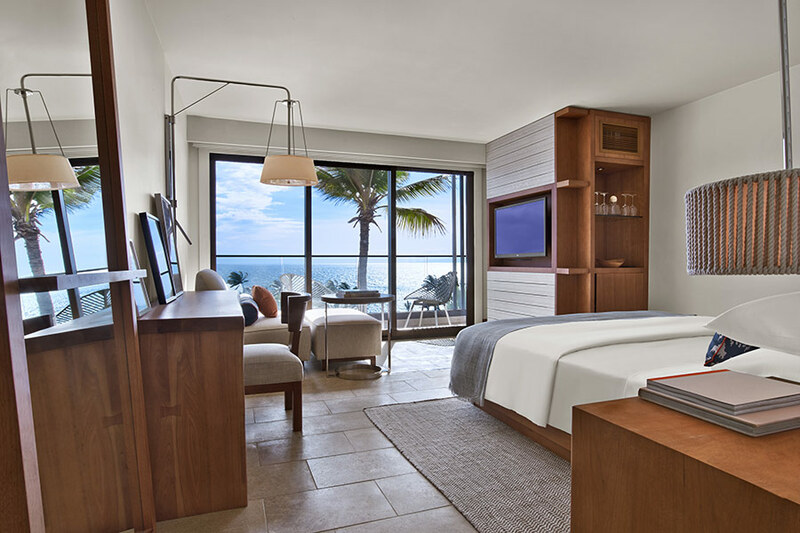 Its latest hotel project, Andaz Maui at Wailea, employs the firm’s signature theatrical style, seamlessly blending it with the magical atmosphere of Hawaii. 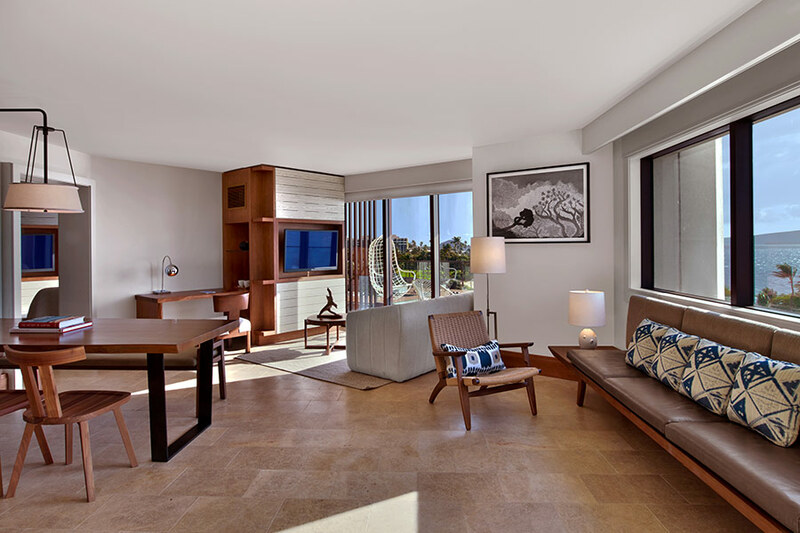 Completed in September 2013, the resort encompasses 15 acres on Maui’s south shore, an exclusive area known for its five-star hotels and scenic golf courses. The project called for overhauling three existing towers that made up the Renaissance Resort, shuttered in 2007. Rockwell also revamped the grounds and proposed five buildings containing 19 villas. The overall design intent, said firm partner Shawn Sullivan, was to create a luxurious environment that embraced the outdoors and incorporated references to local culture. 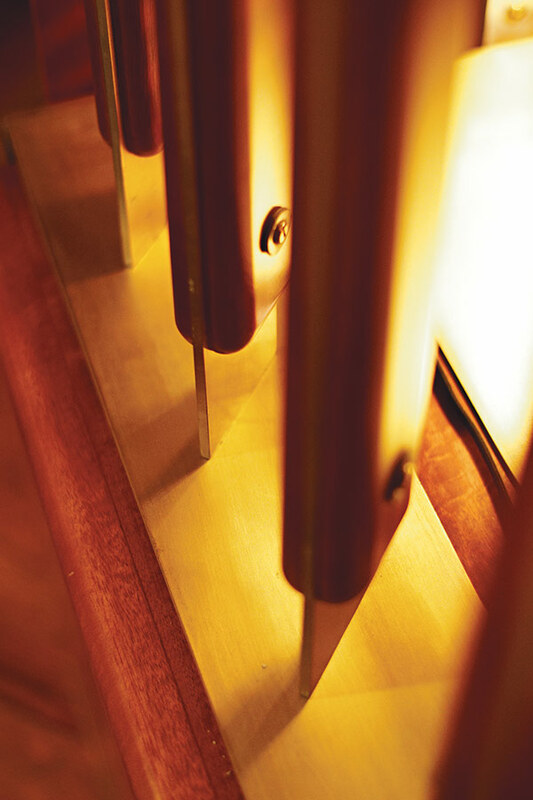 The captivating experience begins right as guests arrive. A covered, wooden and stone bridge overlooks a serene reflecting pool and leads to the hotel’s main entrance. 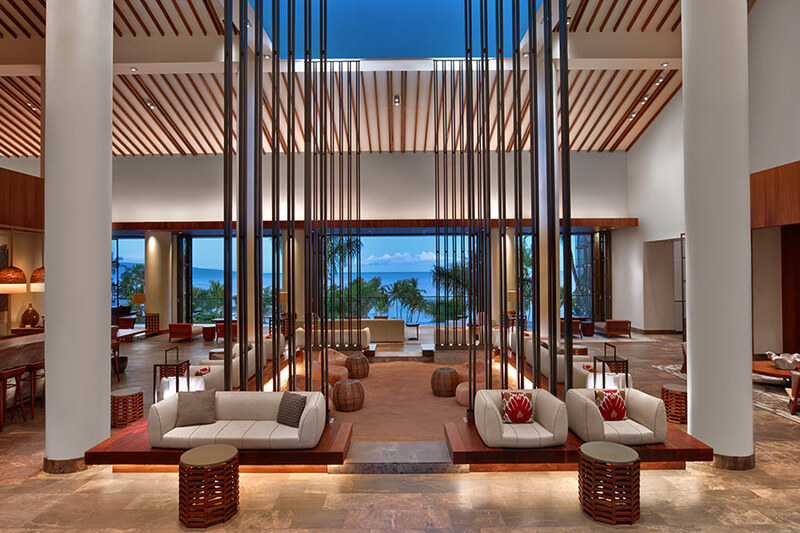 Guests are ushered into an 8,000-square-foot lobby, where natural light cascades down through a large skylight and ample glazing offers views of the turquoise ocean. In the center of the lobby, a sandpit with free-form chairs lends a playful touch. 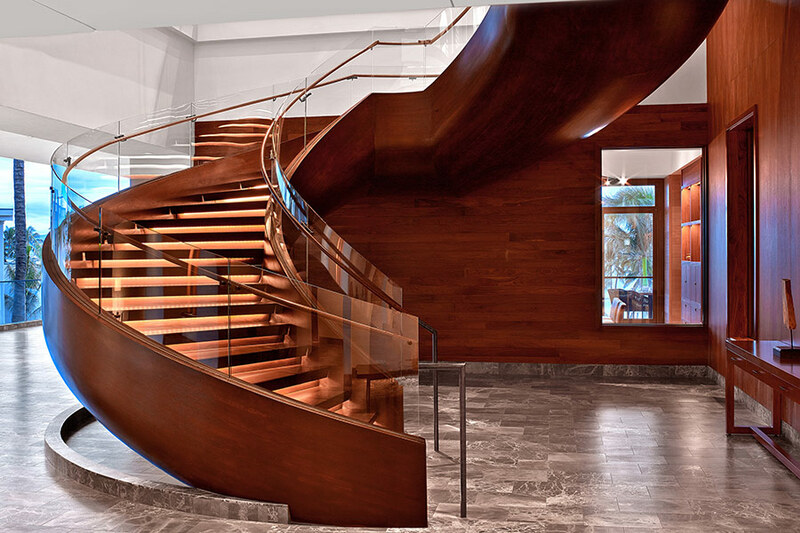 A grand staircase sculpted of wood—inspired by traditional Hawaiian canoes—leads to a bistro serving seasonal cuisine. Other public spaces include a Morimoto restaurant, five meeting rooms, and a ballroom with a bespoke lighting installation made of glass pendants and braided ropes. 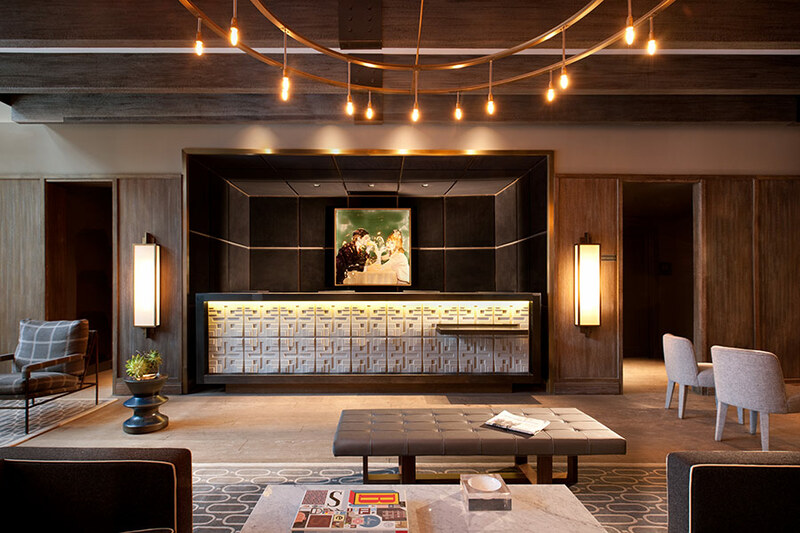 For the hotel’s villas and 290 guest rooms, Rockwell created fresh, modern spaces filled with natural light. Custom furnishings include platform beds, walnut side tables, and vanities with teakwood slats. Sliding glass doors open onto terraces that enable guests to take in the breathtaking surroundings. Manhattan’s West 57th Street has drawn considerable attention for the spindly glass skyscrapers now rising there. But set within this crane-dotted corridor is a new 30-story tower that stands apart for its rigor and refinement, both inside and out. 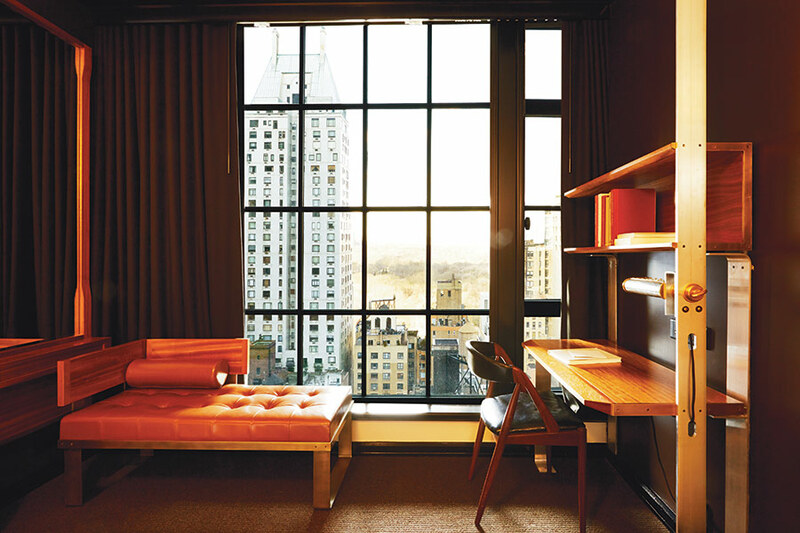 Completed last fall, the 240-room Viceroy Hotel was designed by Roman and Williams, the renowned firm behind such influential projects as the Ace Hotel and The Standard, High Line. 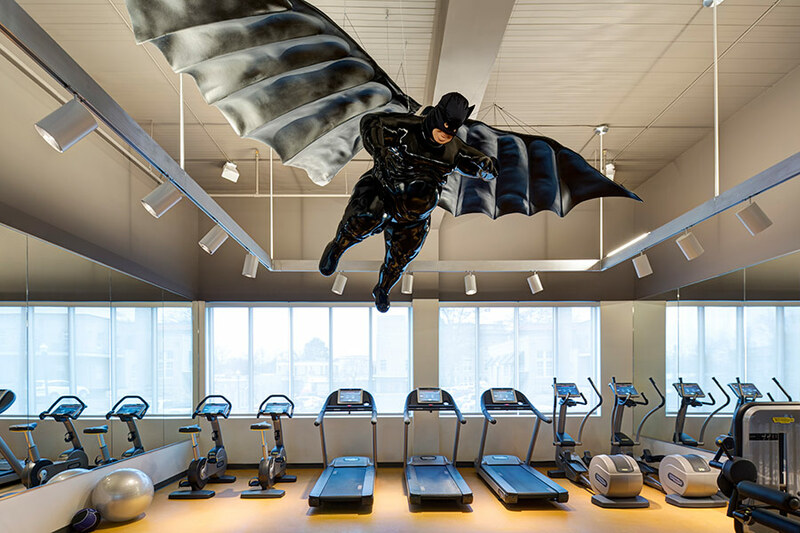 Founded in 2002, the firm is led by the husband-and-wife team of Robin Standefer and Stephen Alesch, former Hollywood film set designers who have a remarkable talent for producing deftly curated, atmospheric spaces. The Viceroy, for which they envisioned the interiors and the facade, marks the duo’s largest project to date. Unlike the shiny, modern towers cropping up nearby, the Viceroy harkens back to glamorous old New York. Standefer and Alesch drew inspiration from varied sources—ocean liners, artist lofts, and film noir among them. Their overall vision was to create a hotel that feels “industrial and creative” yet still emits an air of confidence and sophistication. “There is nothing shy or humble about this project,” they said. Slipped into a narrow lot, the masculine tower is faced with a grid of blackened steel struts and muntined windows, establishing an aesthetic the designers refer to as Neo-Miesian. Once inside, however, the Miesian reference quickly fades. In the warmly lit, double-height lobby, no surface was left unadorned. 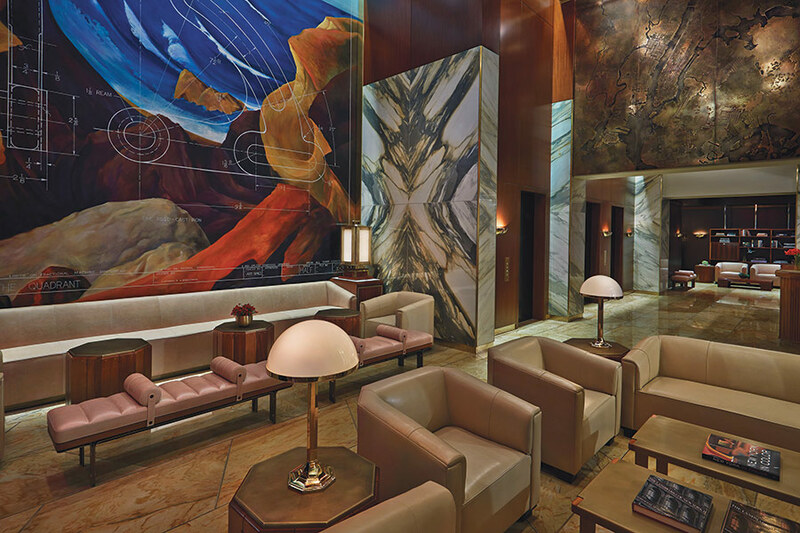 Walls are sheathed in dark-toned wood and heavily veined marble; on one wall, an imposing mural inspired by the Regionalist painter Thomas Hart Benton lends hues of red, blue, and orange to the opulent space. 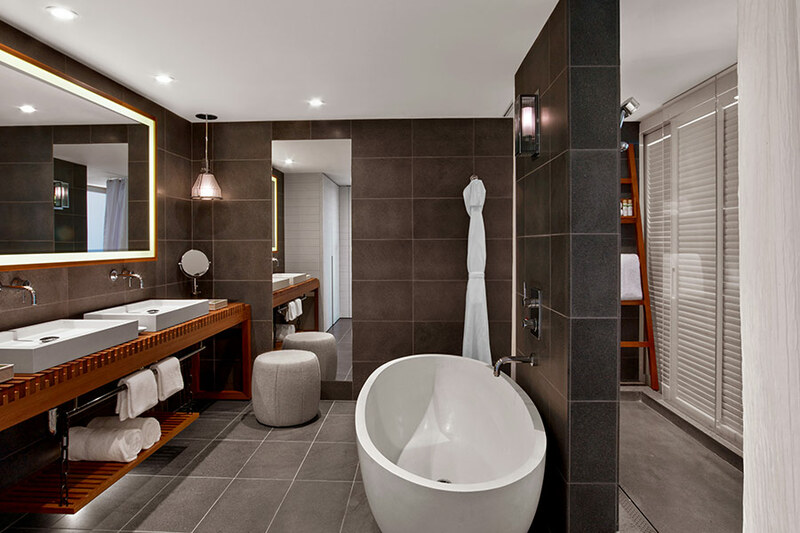 Efficient yet elegant, the standard guest rooms are reminiscent of ship cabins. Beds are set within tambour-paneled wall units made of iroko, an African hardwood; the units contain clothing storage, nightstands, and a mini-bar. 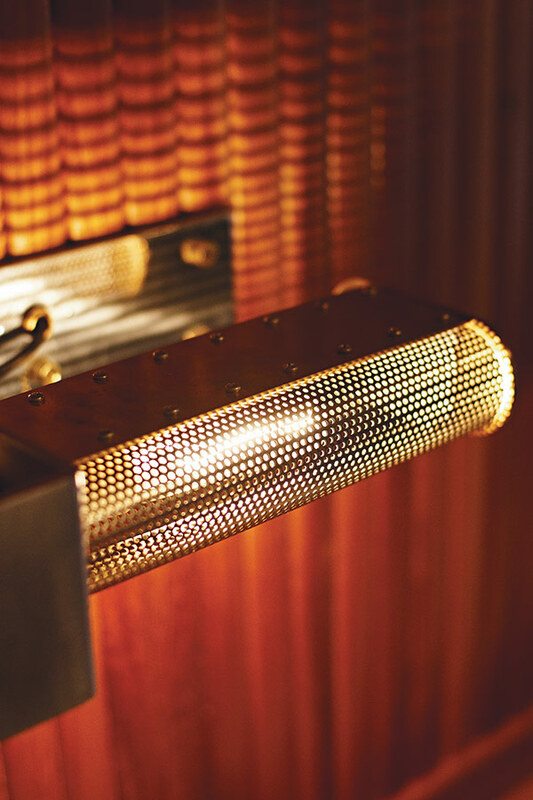 The rooms are fitted with custom lighting fixtures made of perforated brass and aluminum. 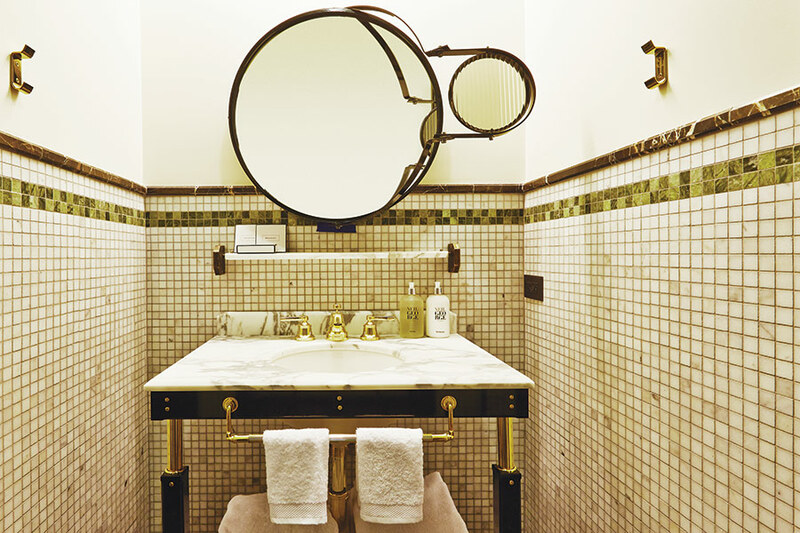 In the bathrooms, the designers employed a color palette based on American currency: olive greens, blacks, and ivory. The nautical theme is continued within a rooftop bar, which features ipe flooring, brass detailing, and walnut-and-leather sofas. In contrast, the Kingside restaurant at street level evokes an upscale diner, with its red stools and black-and-white checked floor. While the Viceroy has properties around the globe, from Aspen to Istanbul, this is the company’s first hotel in New York. CEO Bill Walshe said Roman and Williams has redefined interior landscapes within the city. “Partnering with them on a ground-up project felt like the perfect entré into New York,” he said. Over the course of her illustrious career, the British designer Tara Bernerd has taken on an array of projects, from nightclubs and department stores to the interior of a 150-foot private yacht. 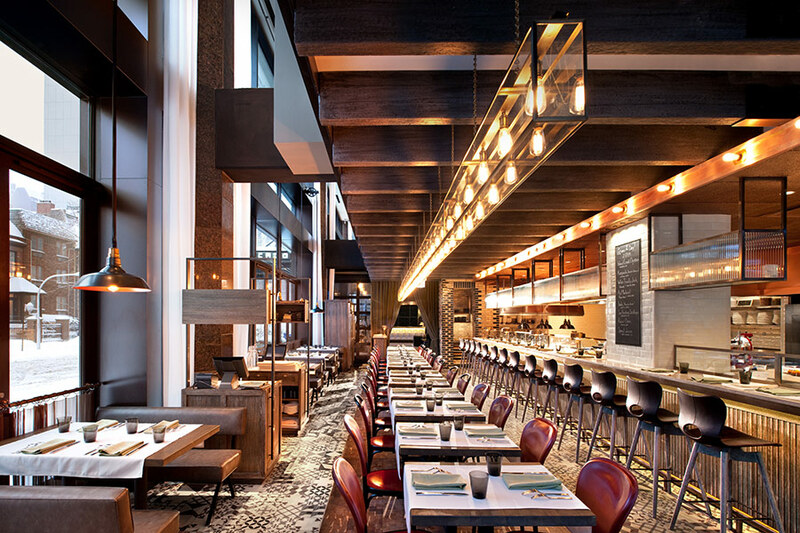 In 2012, she completed Belgraves–A Thompson Hotel. Located in London, it was the hospitality company’s first property outside of the United States. 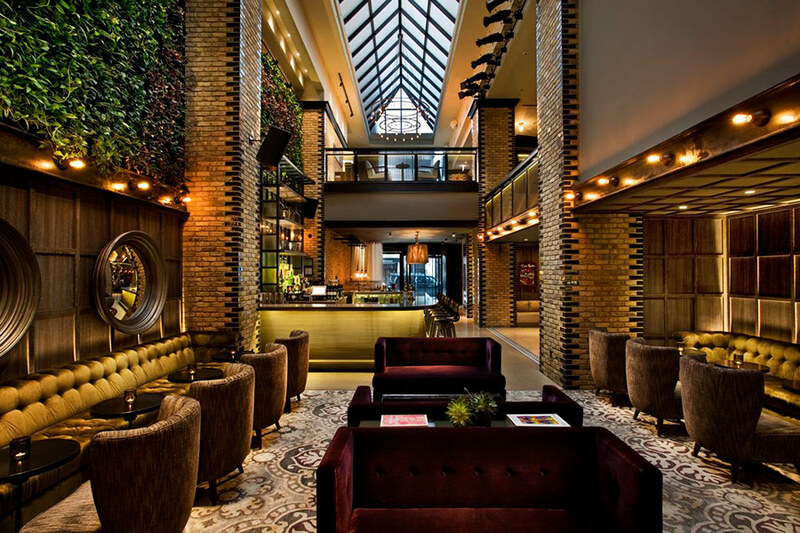 Now, Bernerd has produced another edgy, boutique hotel for the Thompson portfolio, this one on American turf. 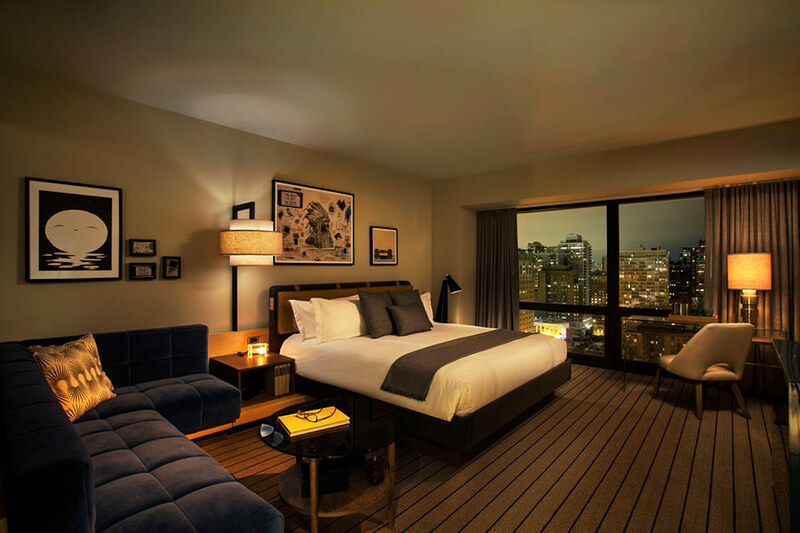 Thompson Chicago, which debuted in October, occupies the former Sutton Place Hotel, built in the 1980s in the city’s exclusive Gold Coast district. 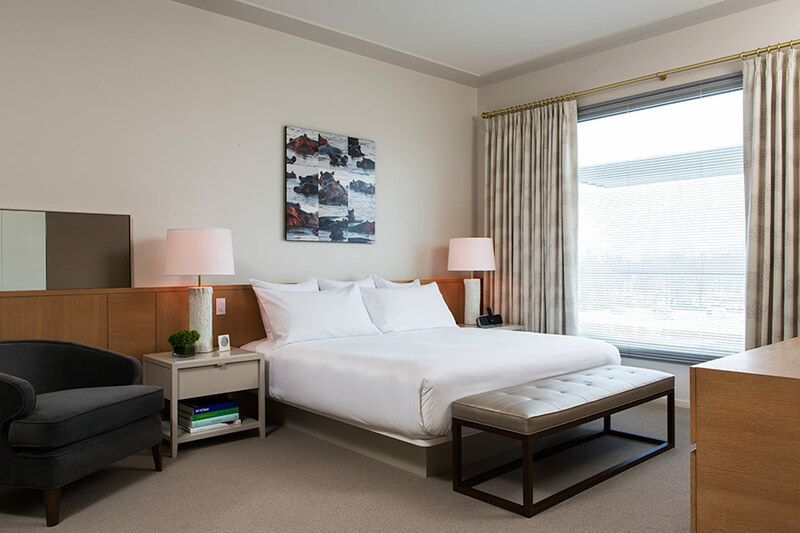 Following an extensive interior makeover guided by Bernerd’s firm, Tara Bernerd & Partners, the 23-story building now contains 247 guest rooms, six two-level penthouse suites, a fashionable restaurant, and more than 12,000 square feet of meeting and catering space. The overall goal, said Bernerd, was to create a comfortable, “rough luxury” atmosphere. “We wanted it to feel aspirational but not intimidating,” she said. 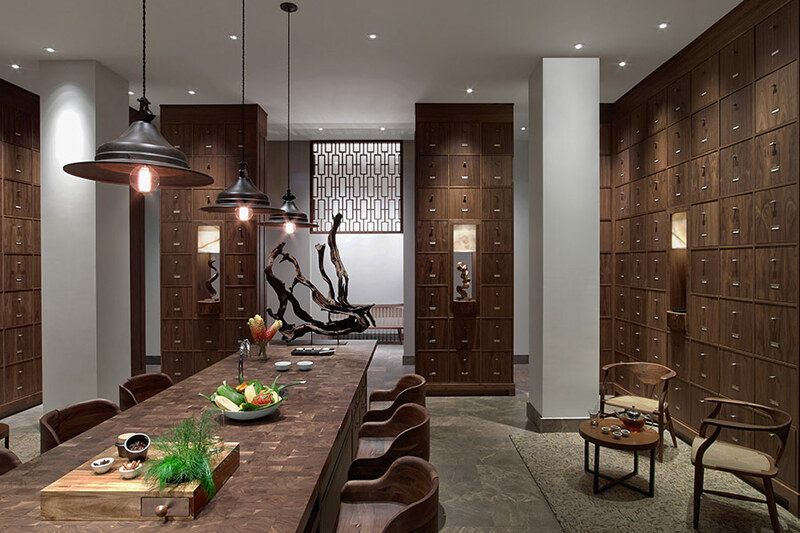 Visitors enter a lobby that promptly reveals Bernerd’s knack for crafting environments that are sophisticated yet cozy. A timber-beam ceiling, wood paneling, weighty bookshelves, and seating upholstered in tweed encourage guests to linger with a cup of coffee and their favorite novel. 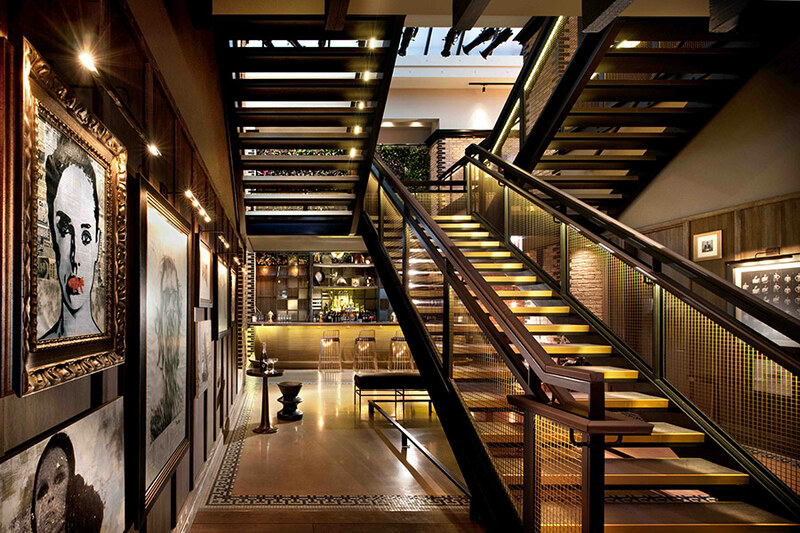 Just off the lobby, a staircase constructed of black iron and brass mesh lends a subtle, industrial vibe. 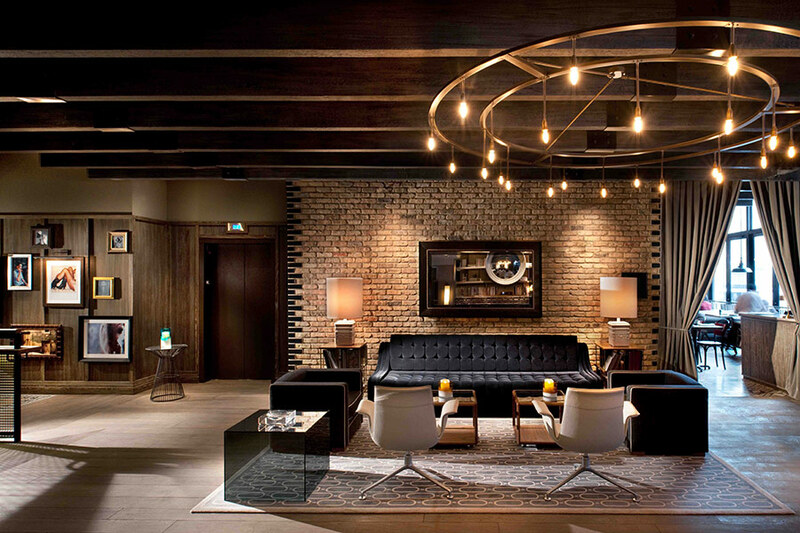 Throughout the hotel, raw materials such as concrete, metal, and brick are used in a ways that Bernerd describes as “seductive and soft” while still conveying a sense of refinement. 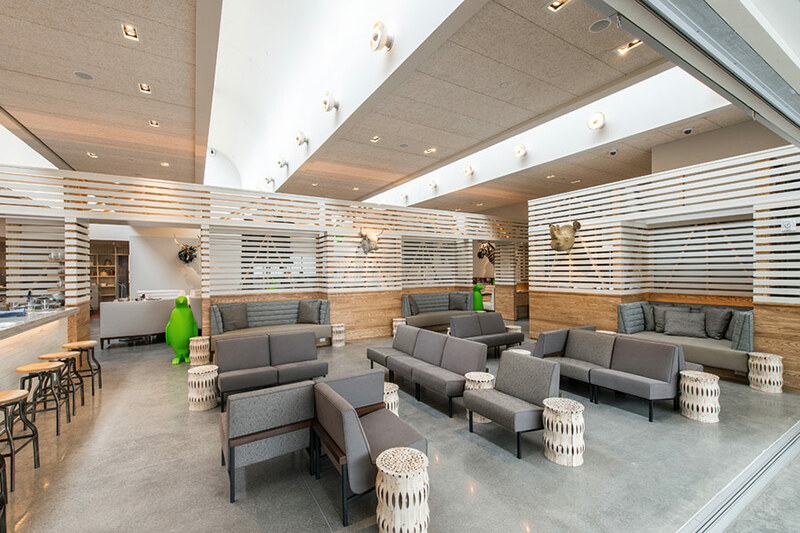 The lobby leads to a double-height atrium housing Nico Lounge, where a verdant, living wall measuring 36 feet wide by 22 feet tall serves as a striking centerpiece. 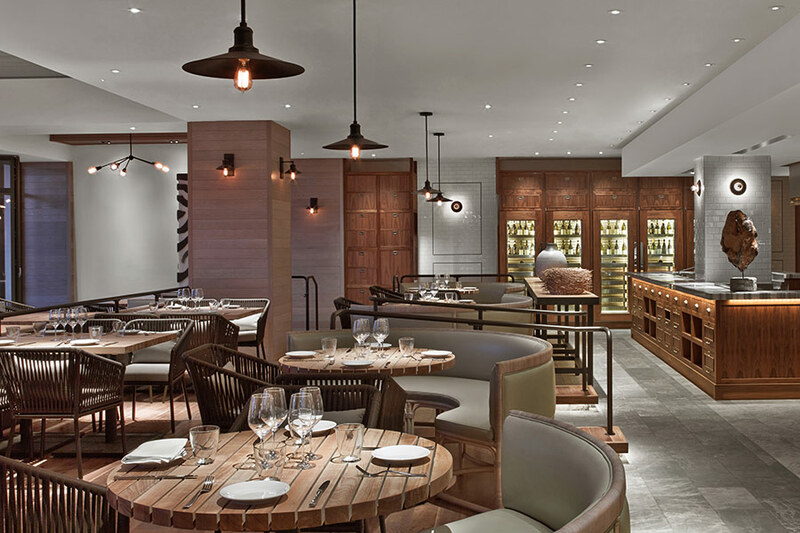 Adjacent to the atrium is Nico Osteria, an Italian seafood restaurant led by the celebrated chef Paul Kahan. Its design includes a large open kitchen and Scandinavian-style tables and chairs.